Why Do Caterpillars Have Bristles? Walking through your backyard or garden, you probably have seen a wide variety of caterpillars. Some appear sleek, with a squishy skin, while others appear covered with little hairs of bristles. These little bristles, or setae, are a method of protection for the moth or butterfly larvae. While many of these furry little creatures are harmless to humans, some of those bristles are capable of injecting toxins into the skin and causing severe reactions. More than 50 stinging caterpillars reside in the United States, with common ones being the saddleback caterpillar and the puss caterpillar. The bristles, or setae, are a means of defense for many caterpillars. While the bristles on some species do not cause irritation, others have urticating hairs that cause irritation. There are two different types of urticating hairs. Envenomating hairs are hollow and filled with venom that is produced by a gland at the follicle base. When you touch these hairs, the tips break off and allow the venom to release. Other hairs do not produce or contain venom but are sharp and easily dislodged, often penetrating into the skin, causing irritation. When a predator tries to eat these caterpillars, they experience extreme discomfort. This works to the advantage of those caterpillars with nonirritating bristles. Predators remember that bristles cause pain and leave them alone as well. The saddleback caterpillar, or Acharia stimulea, is best known for its saddle markings. The saddleback is a slug-like caterpillar with a brown color at both ends. In the center is a bright green pattern bordered with white, similar to a horse saddle. At each end, the saddleback has large tubercles. Both the sides of the body and the tubercles have long setae that deliver toxins upon contact. The saddleback resides throughout the eastern United States, from New York down to Florida and as far west as Texas and Kansas. Contact symptoms include intense burning, rash, blistering and perspiration in the area. In severe cases, symptoms can include migraines, gastrointestinal upset, asthma complications, hemorrhaging and anaphylactic shock. While the southern flannel moth may not be a name that makes you stop in your tracks, the larvae stage, known as the puss caterpillar or Megalopyge opercularis, might. This caterpillar is the most venomous caterpillar in the United States. This species resides in the eastern part of the United States, from New Jersey down to Florida and westward to Texas. The puss moth has a teardrop shape and long, silky setae, often looking like a ball of cotton. Colors can vary from yellow to gray or reddish-brown. Hidden among the long setae are shorter bristles that delivers the venom. Symptoms of contact include intense pain and burning at the contact location, red spots or rash, headaches, nausea, vomiting shock and respiratory distress. Other common caterpillars that may cause irritation include the imperial moth caterpillar, the lo moth, the stinging rose, the spiny oak slug, the buck moth and the smeared dagger moth. Not all caterpillars with bristles or hair cause a reaction. Tent caterpillars, such as the Eastern and the forest, are covered with hair but do not commonly cause a reaction when encountered. However, contact with the tents or webs that they build and cover with a thick fluid can cause a reaction. 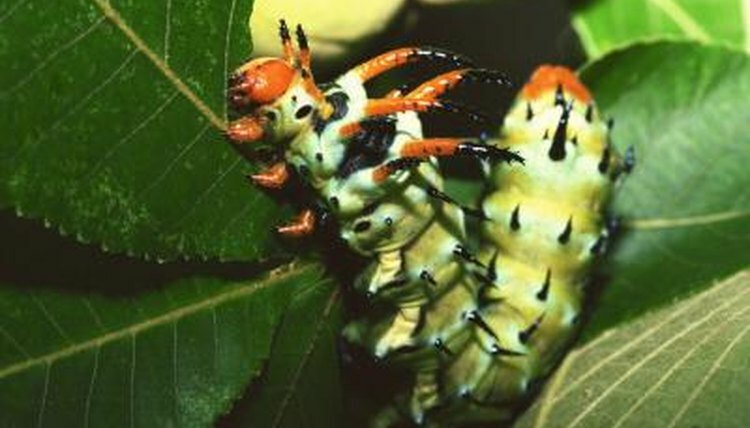 One caterpillar, the hickory horned devil, can grow as long as 5 inches and sports black and red bristles, making it look very dangerous. While this does deter predators, the bristles are actually soft and do not contain toxins. What to Do if a Caterpillar Stings You? Why Do Moths Have Dust on Their Wings?